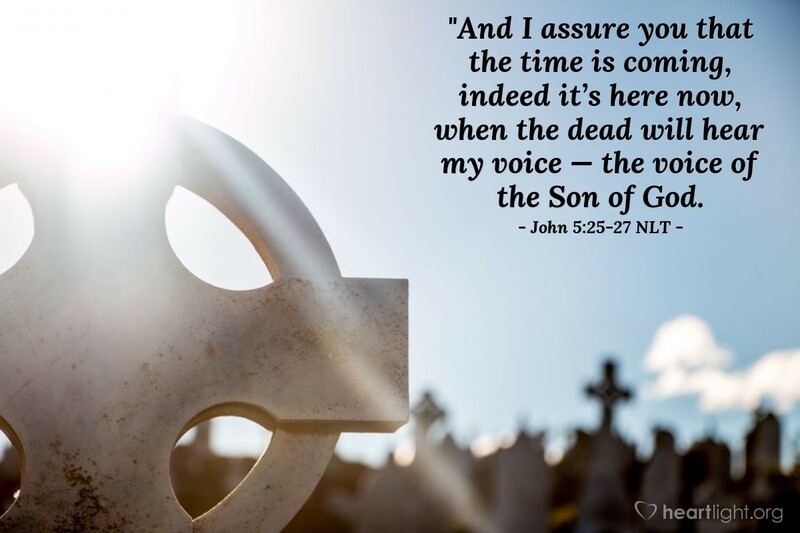 [Jesus said,] "And I assure you that the time is coming, indeed it’s here now, when the dead will hear my voice — the voice of the Son of God. And those who listen will live. The Father has life in himself, and he has granted that same life-giving power to his Son. And he has given him authority to judge everyone because he is the Son of Man." I have a friend who has been deaf for most of his life. He has a great anticipation of the day he will be able to hear again. He tells everybody he knows that the very first words he will hear are these: "Lloyd, this is Jesus. It's time to rise up and come home to be with me in glory!" All of us who have lived for the Lord will hear him call us from our graves. What an awesome thought: Even though I live thousands of years after Jesus' death, resurrection and ascension, I will get to hear his voice and share in glory and grace. Almighty God, Father of all life and sustainer of the universe, you spoke the things in my world into existence. You spoke your word through the prophets and the inspired writers of Scripture. I trust that you will one day have Jesus also call my name, and I will rise up and come home to you. Please accept my thanks and praise until that day is fully realized! In Jesus' name. Amen.